Targeting the niche market of “more variety at less volume” for industrial standard power supply and focusing customers of small or medium volume, MEAN WELL is required to meet different power supply requirements of scores of industries with comprehensive product lines, production flexibility, planned stock, and global channel. Amid 9,500 strong standard models launched as of 2017, MEAN WELL possesses a wide range of product application experience in industries, including LED signage/lighting, industry automation/control, information/telecom/commercial, medical, transport, and green energy. 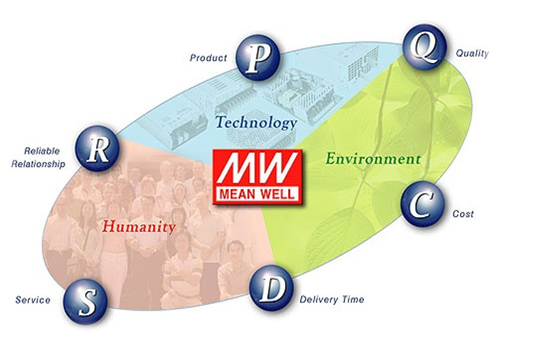 With international safety regulation compliance and full-spectrum one-stop-shopping power supply solutions, MEAN WELL is helping customers cut new product development verification time and costs by early entering target markets. Upholding the idea of “your reliable power partner” and devoting to offer the best power supply product and service MEAN WELL is now able to provide fast, localized services around the world with its global distribution network fostered by continuous efforts and hard works.